Jodi Jones stepped off the bench to fire Coventry City to their third consecutive League One victory, claiming an impressive late three points at Southend United. The second half substitute bagged a stoppage time winner after the home side had been reduced to ten men in an all-action game at Roots Hall. The Sky Blues took the first half lead through Jordy Hiwula and had what looked like a perfectly good goal denied when the referee judged Tom Davies’s effort had failed to cross the line. United then pulled level with super sub Tom Hopper scoring midway through the second half, set up by Simon Cox who was sent off shortly after for a second yellow card. Jones went on as a late substitute for Conor Chaplin as City pushed forward in numbers looking for a winner, and he jinked into the box, created space and fired in low off defender Michael Turner to score the winner in added time. City felt aggrieved as early as the fifth minute when Davies got his head on the end of a Michael Doyle corner. The centre-back celebrated but the goal wasn’t given as the referee said it hadn’t gone over the line, cleared by Theo Robinson at the last second. But Mark Robins’s men got their noses in front from their second flag kick of the game when Jonson Clarke-Harris won the ball in the air, sending it goalwards where Jordy Hiwula turned it over the line to score his first league goal for the club. Southend enjoyed slightly more possession in the opening 45 but Coventry held a good shape and defended well, limiting them to six shots at goal and only one on target, and that failed to trouble Lee Burge. City kept things tight at the start of the second half, content to soak up the pressure and play on the counter attack but they were opened up in the 68th minute when sub striker Hopper pulled his side level. Played in by strike partner Cox, the lively front man turned Jordan Willis at the near post and hit a fine finish past the keeper from a tight angle. 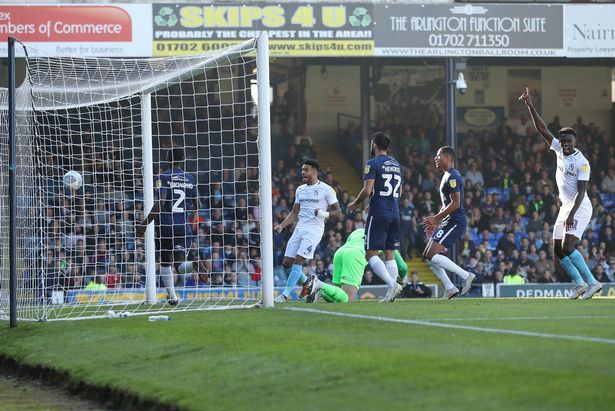 The Shrimpers were then reduced to ten men 12 minutes from time when striker Cox was showed a second yellow card for a foul on Davies, making for an exciting end to the game as City pushed for a winner as Jodi Jones was thrown on for Conor Chaplin. And the young forward came up with the goods with a deflected finish inside the box to win the game for his side, although there was a frantic few moments at the death when City had to defend with their lives amid two late set pieces from the home side.